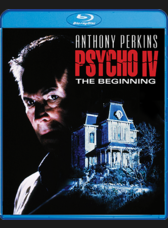 A bit ago, Scream Factory announced that they would be releasing Psycho IV: The Beginning on blu-ray after years of saying that they were not. This came as a bit of a shock to some, but the ones in the know knew that it was only a matter of time before Scream decided that they had made us wait enough. A week or so later, Mick Garris, the director of Psycho IV, said that he was working on special features for the release and that he was happy that Scream decided to give him the time and the money to make the features happen. I am happy about these features. I figured that we would get an interview with Garris that was sprinkled with behind the scenes footage and maybe a trailer (which isn't on the spec list). Scream Factory has gone the extra mile and given us a commentary with not only Garris, but Henry Thomas AND Olivia Hussey. That right there seals the deal for me, but we also get an interview with Tony Gardner, which I know will be worth it. The big thing though is the behind the scenes footage. Garris had made a mention that there was a lot of footage, so hopefully we get to see a good amount of it. All in all I am happy with this announcement. Scream could have given us nothing, but they went the extra mile. Sure, Psycho IV is not a big release for Scream, but they are giving us more than we had thought and that makes me happy.